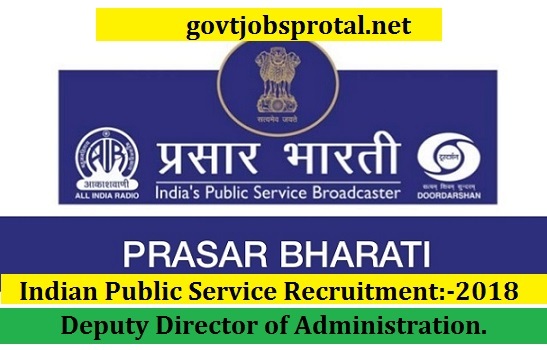 Filling up the post and preparing a panel for vacancies of Deputy Director of Administration (DDA) on deputation basis in Prasar Bharati. 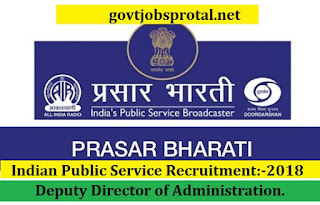 Prasar Bharati intends to fill up 06 posts and prepare a panel for vacancies in the grade of Dy. Director of Administration on deputation basis in Level 11 as per yth CPC pay matrix [PB-3: Rs.15,600-39,1 00 + Grade Pay of Rs.6,600/- (Prerevised)]. Age :-The Officers should not have crossed the age of 56 years as on the closing date of receipt of application Experience & Job Description: The officers should have 5 years experience in Establishment, Administration, Finance, Accounts, Legal and Vigilance matters. The selected candidates would be posted in Delhi. They would be required to handle Establishment Administration/Finance/Accounts/Legal and Vigilance matters. 1.The period of deputation including period of deputation in another ex-cadre post held immediately preceding this appointment in the same or some other Organization or Department of CentralGovernment shall ordinarily be for a period of three years. 2. The terms & conditions and pay & allowances of the officers selected for appointment on deputation basis will be governed as per the provisions contained in Government of India, DoP&T OM No.6/08/2009-Estt(Pay.lI) dated 17.06.2010, as amended from time to time. (You will get more information in employment News paper dated on 16/12/.2017 Page no.(29).) Visit the official website for more information.